I wanted to build a chapel, a place that celebrated the spiritual bond we have with our dogs, a place that would be open to all dogs and to people of any faith or belief system. Stephen Huneck, author and artist of Abrams' beloved children's books about Sally, the black Lab, presents a warm and heartfelt offering to adult dog lovers everywhere. 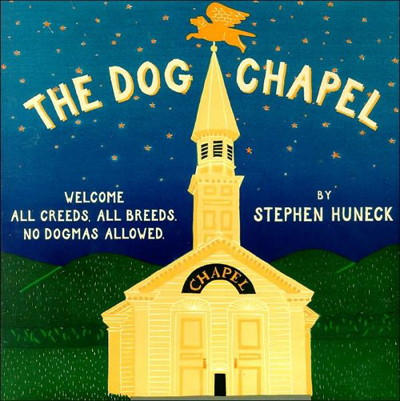 In joyful celebration of the bond between humans and their canine companions, The Dog Chapel gives readers a touching introduction to Huneck, his renowned woodcuts and sculpture, and his greatest artistic achievement: the chapel he built for dogs in St. Johnsbury, Vermont. Magical and transforming, Huneck's book, like the chapel itself, is testimonial to the love, humor, loyalty, and solace dogs bring to our lives every day. Featured in The New York Times and USA Today, on Oprah and the Today show, the Dog Chapel draws visitors, with their dogs, from all over the world. 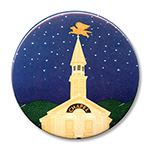 The Dog Chapel includes a preface by Huneck, many color photographs of the chapel, and more than 30 woodcuts. It also includes a pull-out frame that can be sent to the chapel-along with a photo of a beloved dog - where it will take an honored place on the "Remembrance Wall."